Did you know the Mazda Miata is celebrating it’s 20th birthday this year? That’s right… this car first made its debut in 1989. Although it has came a long way, the car still holds true to many of the fundamental Miata features is was built upon – delivering a great roadster convertible for an affordable price. 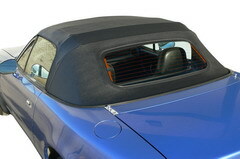 However with so many older ones on the road, the need for Miata convertible tops has been on the rise. This is especially true in many areas with extreme weather; snow, sun, and everything in between. But how does one go about replacing their soft top and how much should the expect to pay? Fortunately, this can be done for a very affordable price. It is possible to buy a high quality Miata replacement top for under a $1,000. Considering that this investment makes your car instantly look newer and increases its resale value, it’s a wise decision for many people. However, count on paying up to $100 to $150 or so more for professional installation. Don’t do this through the dealership unless you want to pay an arm and a leg! You should be able to find a local mom and pop body shop that will install it for next to nothing. The other easy fix you can do on your Miata is a good application of premium wax. There are some waxes which can rejuvenate the shine of your paint. Spend $25 on a bottle of wax, some terry cloths, and a couple hours of your time, and you can instantly shave a few years off your car’s age. This is a great article! Is it possible to install a convertible top by myself?